BET applies to type 2 and 4. That is basically unanimous. The sample that shows loop of H3 type have (very likely) no micropores (small uptake in low p/p0 range). In this case you can apply BET theory in common p/p0 range (0.05-0.3). 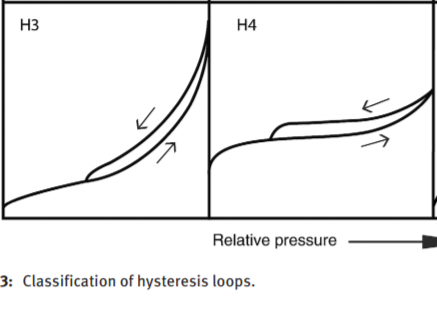 The sample that shows H4 hysteresis have micropores (large uptake in low p/p0 range). The BET theory can be applied here, but in a much lower p/p0 range. For activated carbon, for example, one would look for a linear(!) range between p/p0 = 0.02-0.1. Generally, the BET theory is not suitable for microporous materials. How does a Brunauer–Emmett–Teller device function? Do bond energies differ for surface and bulk atoms in nanoparticles? How does water freeze and crystallize on a cold superhydrophobic surface? Can negative adsorption be considered equal to sorption? What is the difference between BET and Langmuir model for calculating the specific surface area?